Home theaters aren’t a necessity in the home, but if you’re after a fun space to relax and watch TV and films with maximum visual and sound effects, installing a home cinema could be the way to indulge in your hobby at home. 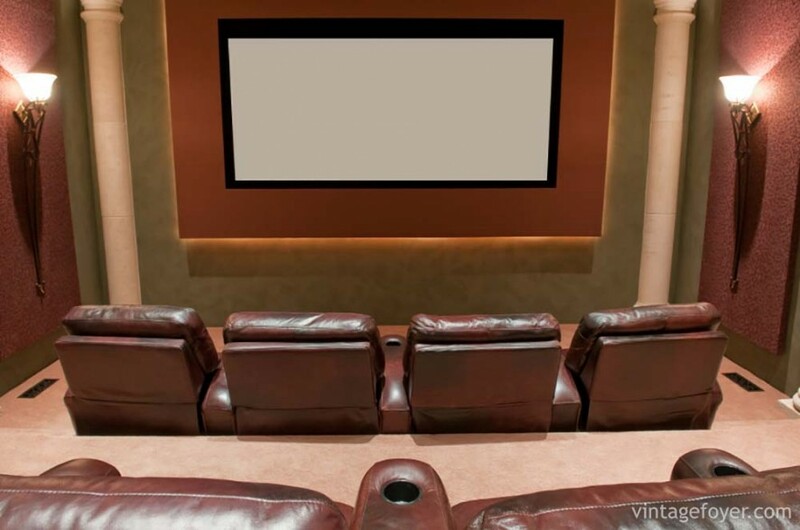 It isn’t just the rich and famous who can have cinemas in their own home, it’s actually possible to create your own personal movie theater in your home on all kinds of budgets. One thing you do need is space, but even if that’s limited it’s still possible to create a cozy home cinema with a few cozy seats. There isn’t one straightforward style of home cinemas, how you create your room is entirely dependent on you and your personal taste. 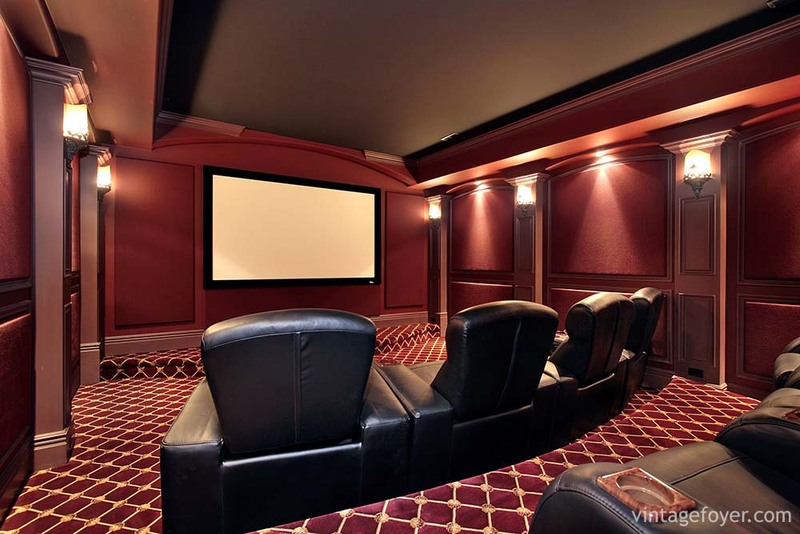 If you’re considering your own home cinema or flirting with the idea, take a look at our photo gallery of 36 stunning home cinemas for inspiration. 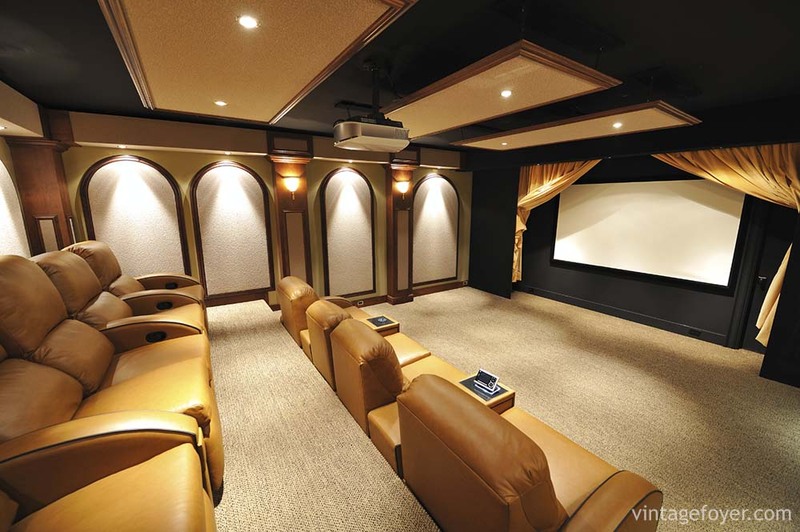 This small but luxury home theater takes form of a traditional and usual home cinema style. The comfortable chairs, large screen, red curtains and informal seating at the back of the room give a space that the family can enjoy together. This more informal home theater consists of a simple corner sofa set on a diagonal alignment and one large scheme. There are no distractions in the room, and its ultimate goal is comfort. This is a gorgeous lower budget option. Another informal option, the seating in this room is set back from the screen and given a ‘living room’ feel with a matching sofa set, but the screen is large enough to take the main spot of the room. 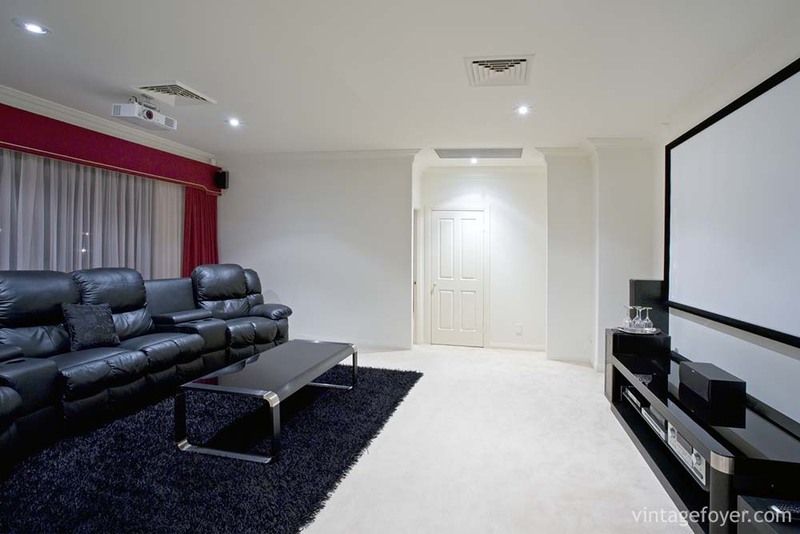 This is a double function room; cinema and general living. This modern home cinema has all the main features of a family room or living room, with a big screen as an addition rather than a main feature. 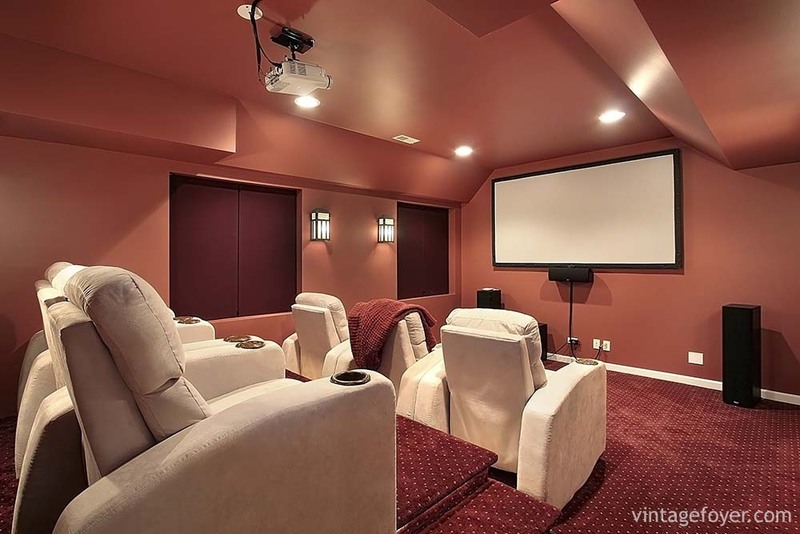 This has more of a traditional ‘television room’ in a family home, rather than a ‘home theater’. 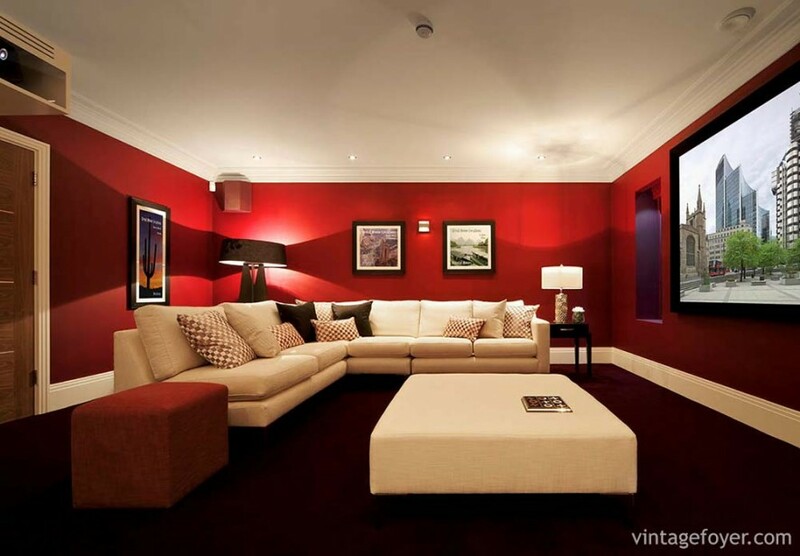 Can’t justify using a spare room just for a home cinema? Double up your space by adding storage space like this screen surround. Limiting your chair count to just one or two chairs will make the room even more personal. 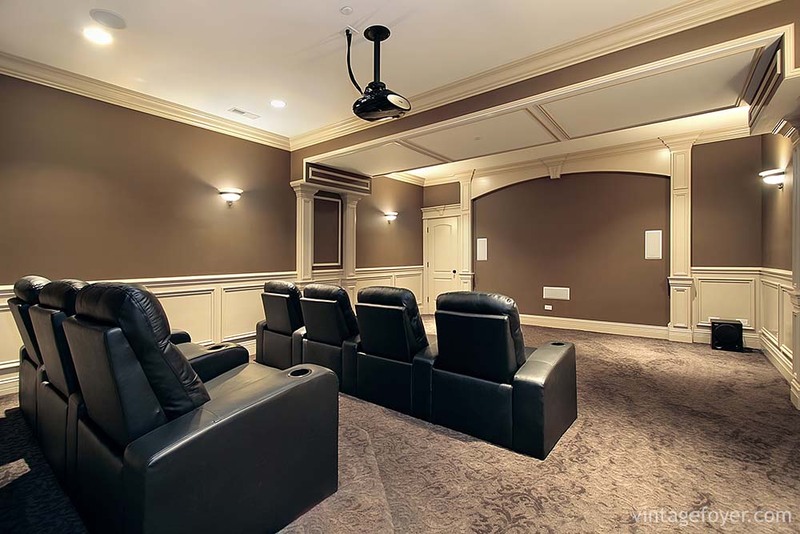 This combination of general sofa seating at the front of the room and luxury theater seating towards the back means that this home cinema has plenty of options to meet the needs of the entire family, but can also seat twice as many, turning its use into a social occasion. 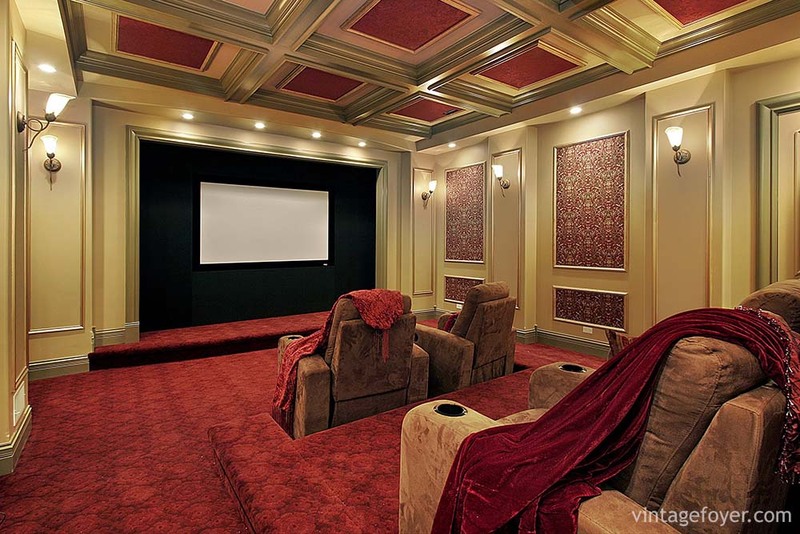 This stunning home theater follows a traditional style, but takes on its own modern color palette. The stylish brown theme with lots of textures and a brightening white look fantastic and give the room a very trendy edge. The relaxed lighting and additional storage give this room a very comfortable and social feel. The atmosphere is light and relaxed, and shelving space surrounding the screen gives the family options for adding items of decor to their personal tastes. 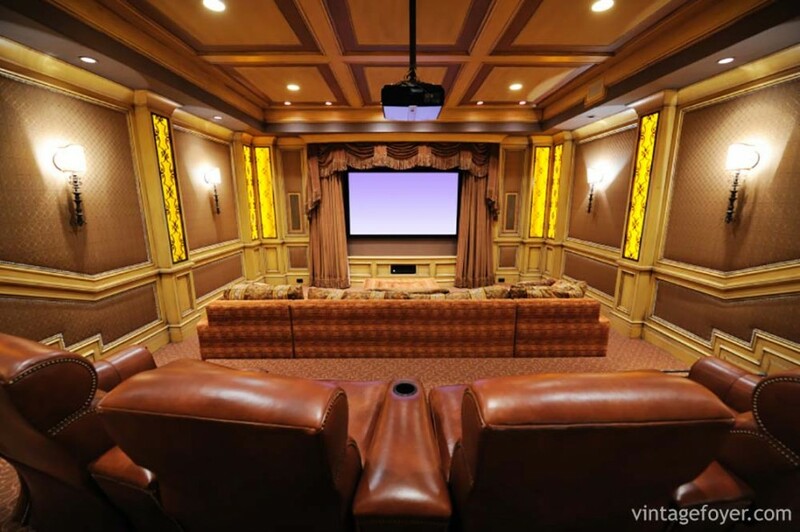 This large home theater has limited its seating numbers to 6, although there is plenty room for more. This high quality design and build has added seats to the premium space that gives the best view of the high definition screen. This clever home cinema has instilled warm color tones throughout the room to support the room’s atmosphere. 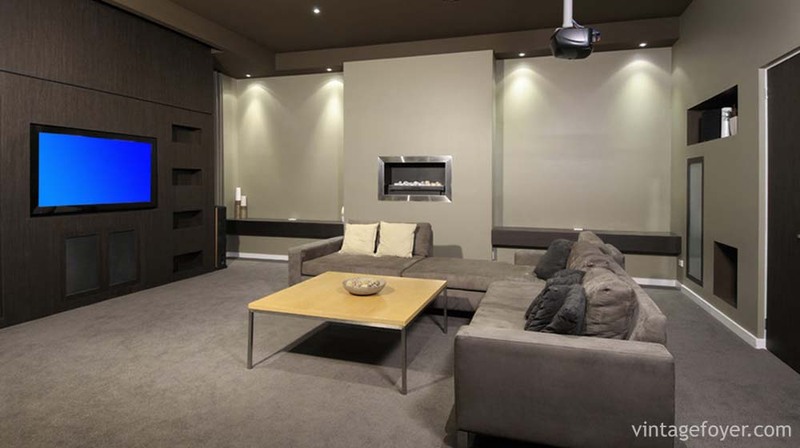 Combined with the gorgeous use of textures, we have a modern home cinema that is comfortable, warming, and enveloping. 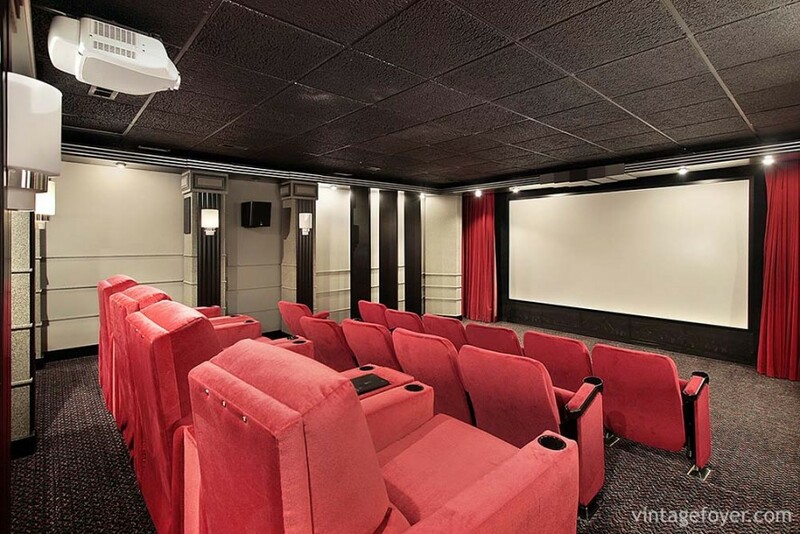 This gorgeous home theater has taken its style inspiration from vintage picture houses in the Art Deco period. Bold contrasts between claret and gold, geometric patterns and luxurious seating make this a luxurious and elegant space. 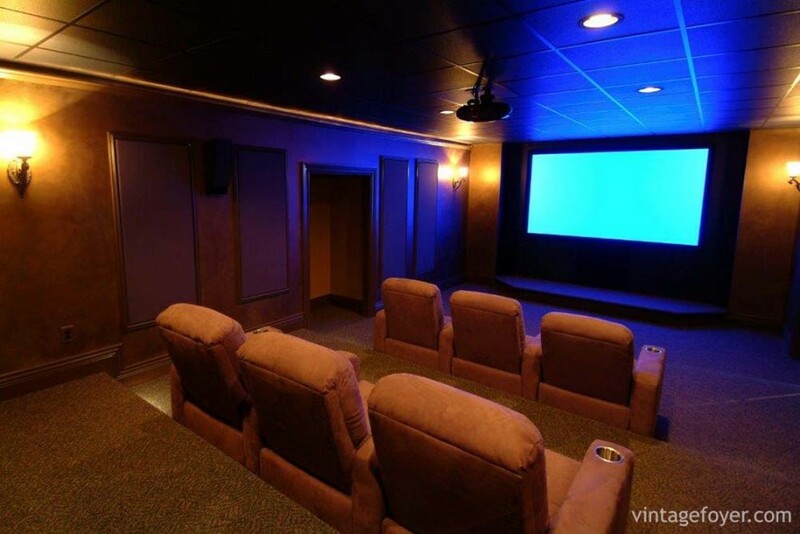 Most of the examples we’ve seen of home theaters already include the screen at the narrow end of the room. 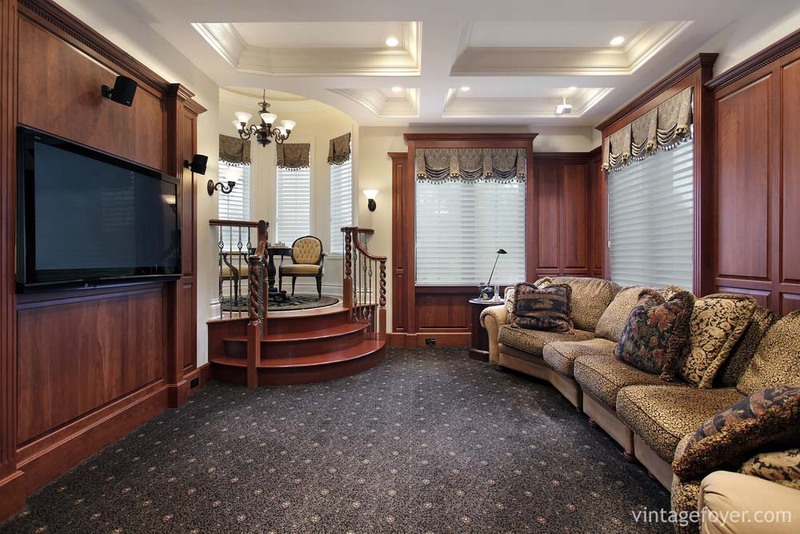 This unique and homely room has included a large widescreen television on one of the widest walls in the room to add even more width the home, but can be viewed from all of the room’s seating options. 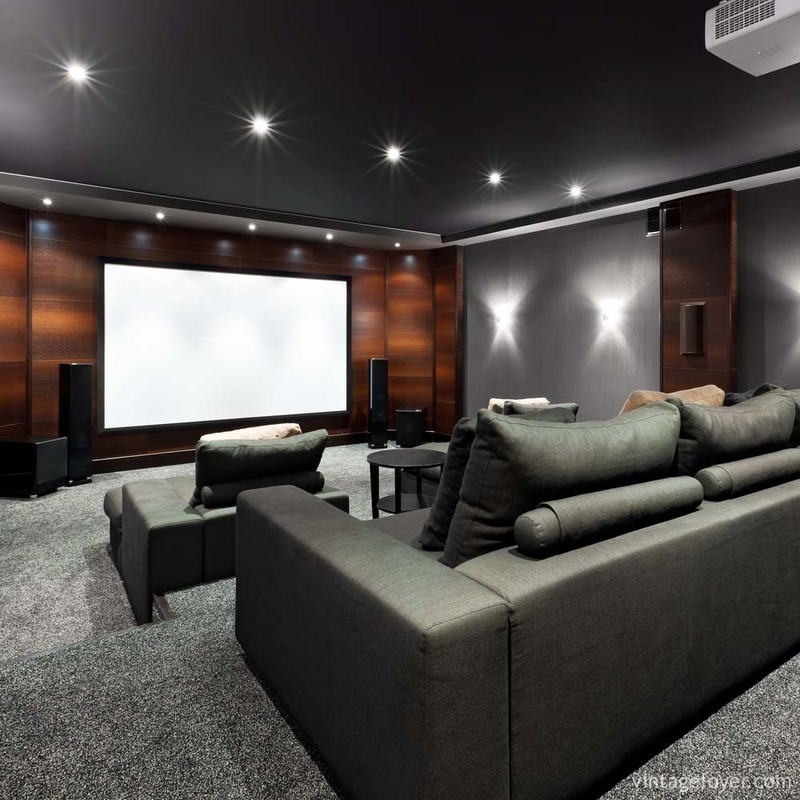 This modern and more contemporary examples uses a simple black and white colour palette with no distractions and lots of texture to create a simple and luxurious yet striking home cinema. 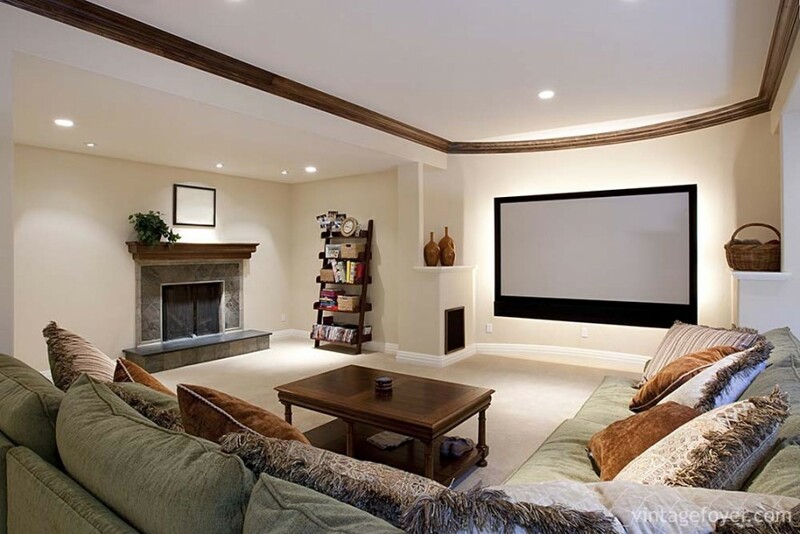 Instead of installing a complete built in home theater, this family has simply added a projector and screen to the ceiling and wall in an already decorated family room. 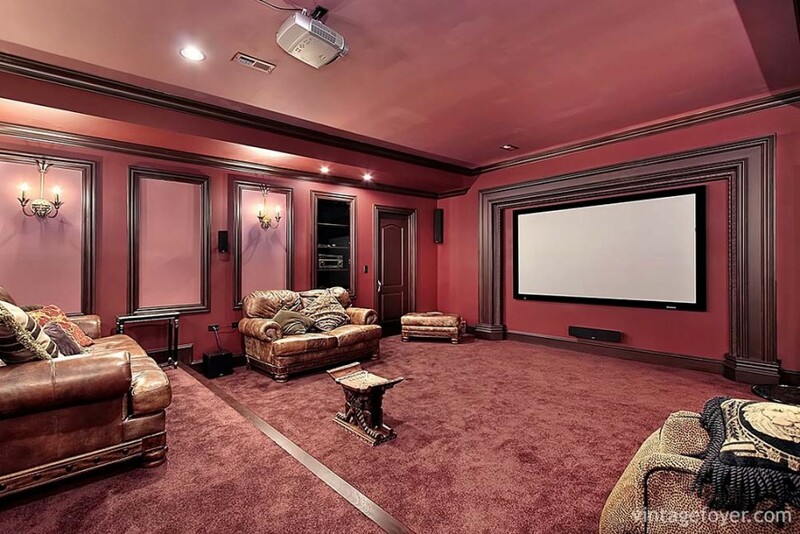 Proof that you don’t need to overhaul your entire room to create a home cinema. Cinemas and theaters of old traditionally were decorated in shades of red and gold; both very warming colors that highlighted the expense and extravagance that was included to a trip to the theater. 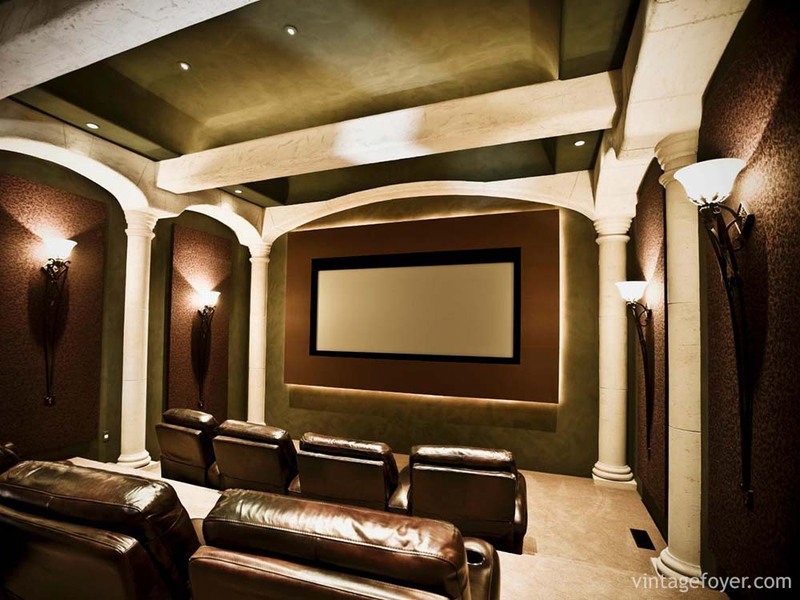 That trend is still alive today, but installing it into your home complete with soft textures will give your home theater space a nod to elegance and comfort. 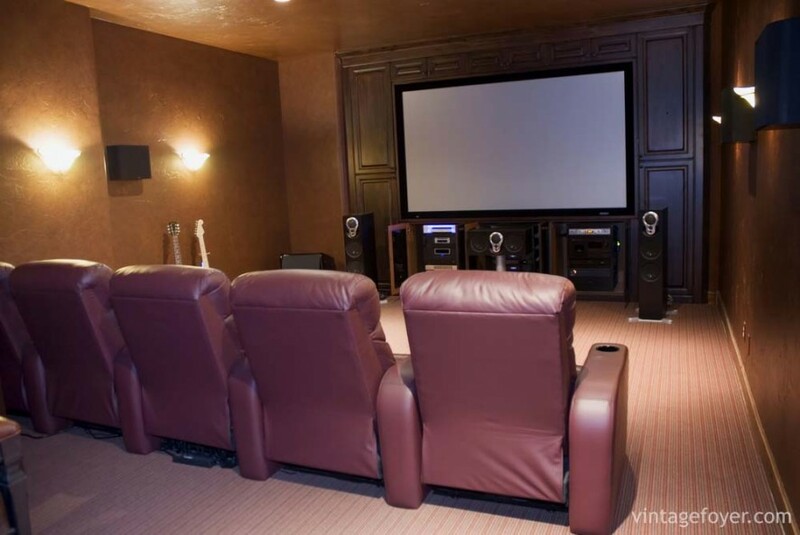 This is a modern twist on the traditional home theater layout. It’s similar to the tiered seating and grand screen and surround speakers, but the color scheme is a stylish and sleek grey and smooth, dark wood. 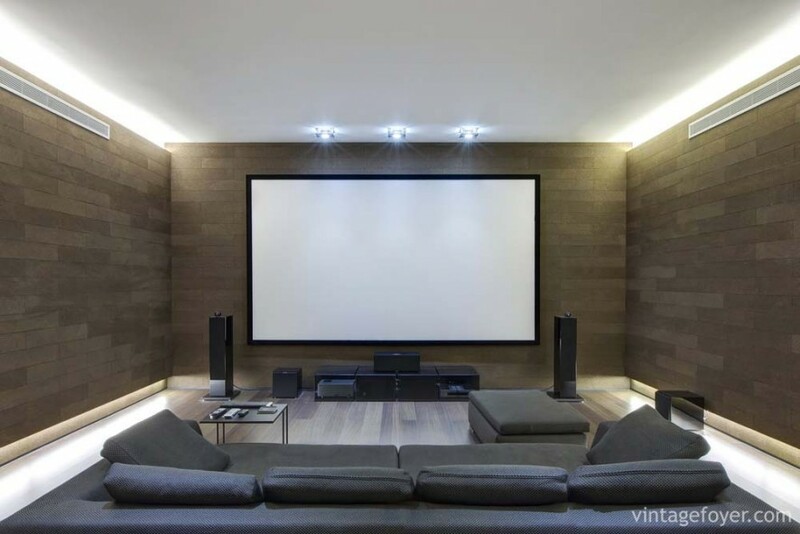 This super cool cinema room has all the makings of a modern and minimal living room, with a cooling and masculine color palette. 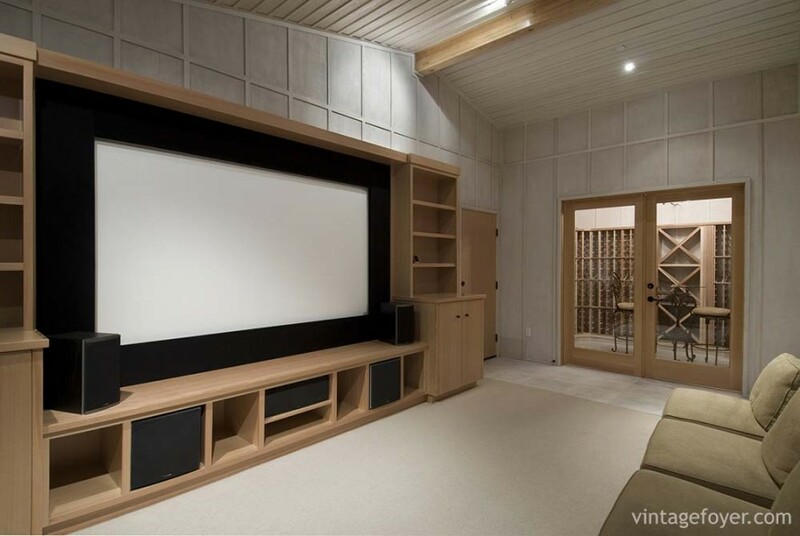 The cinema screen has been integrated smoothly into the wall and it sits flush so it doesn’t add any unnecessary impact into the room or disrupt the smooth lines. Bring your home cinema to life and keep that mid-century charm by incorporating lots of geometric patterns and varying textures into the room. If you want a comfortable and cozy room where you can snuggle up with a film and not worry about the room’s atmosphere, choose a warming colour that has impact, but isn’t too bold to detract from the main purpose of the room; the screen.  Cream is another warming color that doesn’t pack much personality, so it makes a great color palette for a room where you want the content on the screen to dictate the room’s atmosphere and feeling. This is a cooler and more subtle variation of the terracotta example above. If you’re going to be sitting down for hours indulging in full length movies, you need to invest in durable and comfortable seating. We love these larger than life burnt orange chairs with soft textures and lots of bounce. 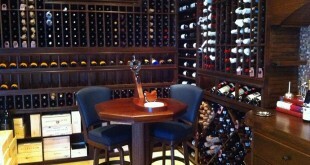 Like to dine while you watch? 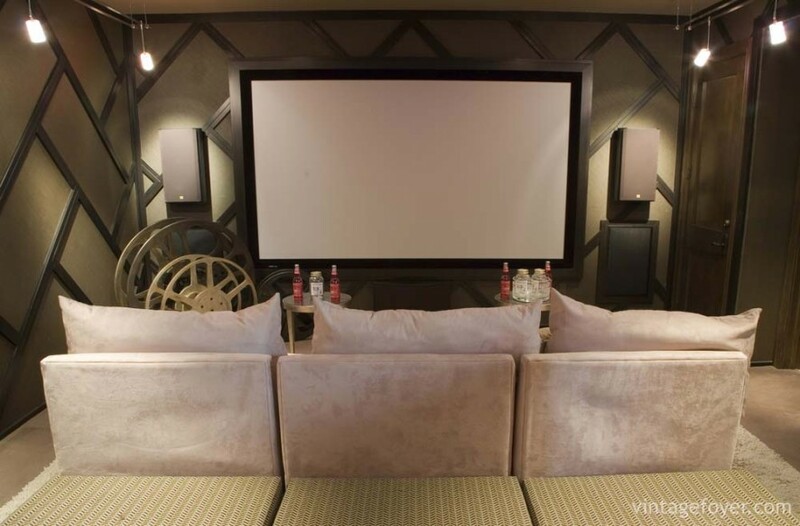 This quirky home cinema is perfect for couples of families who are looking to dine and drink while they relax and be entertained. 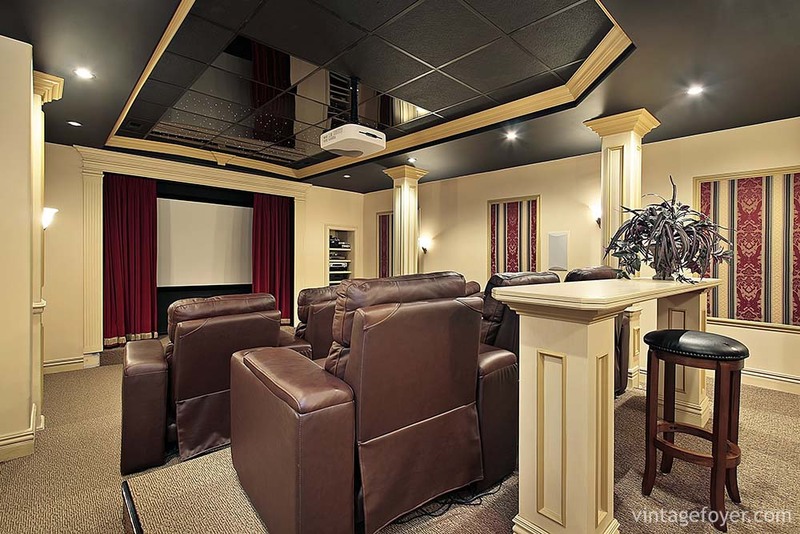 Make room for refreshment and informal dining to transform the usual home theater experience. 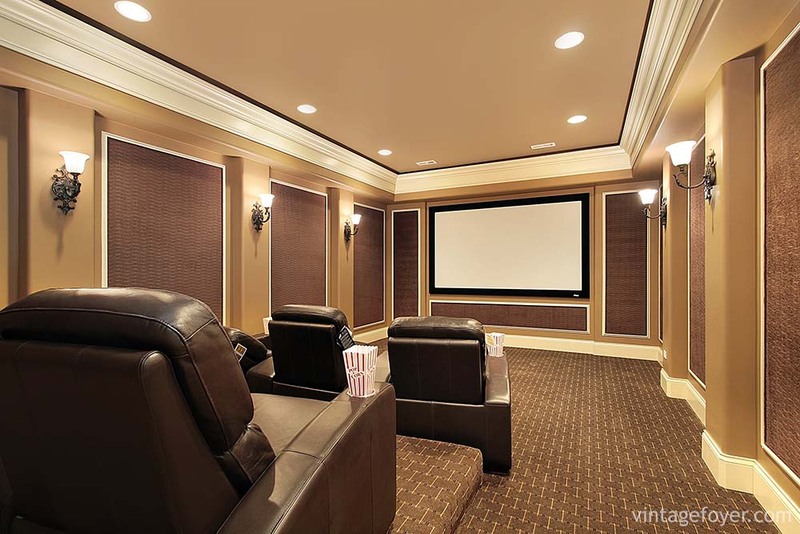 Even if you don’t have a huge budget to revamp your entire room, you can create your own home cinema with some plush seating, a large wall space and a widescreen television. For added effect, you can install spotlights or uplighters to help dictate the room’s shading and intensity. 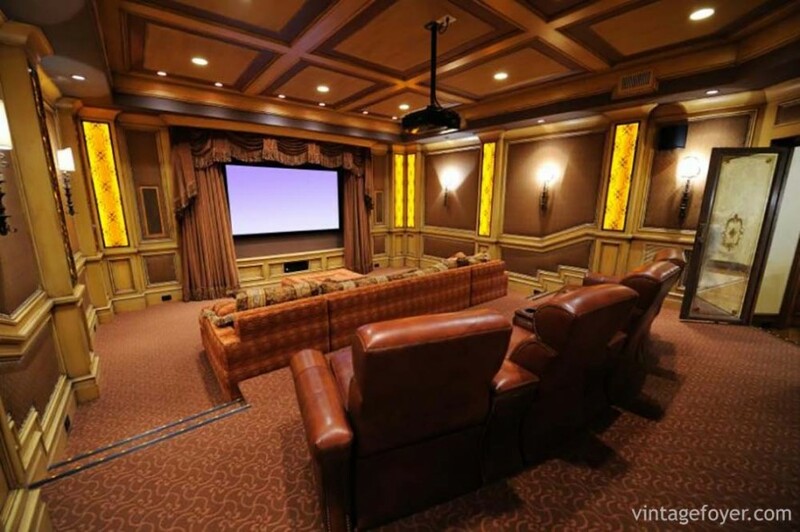 Struggling to find space to create your home theater? 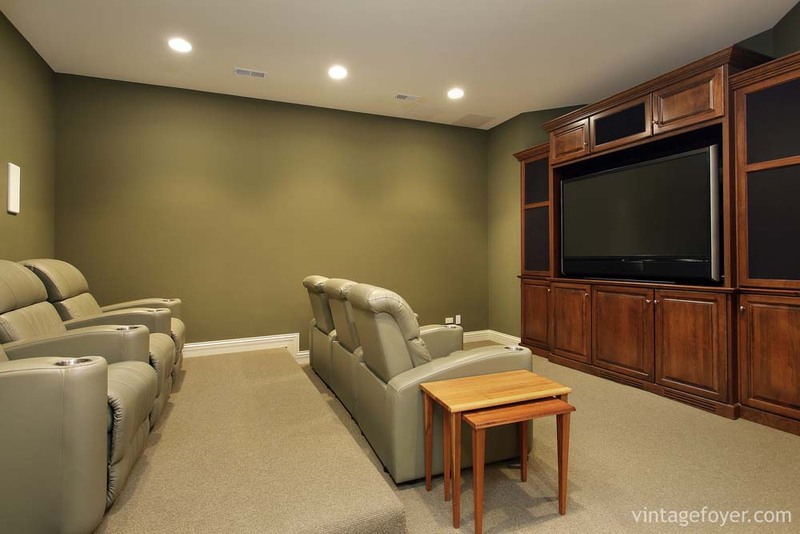 Consider overhauling your basement into your own personal television or cinema room. 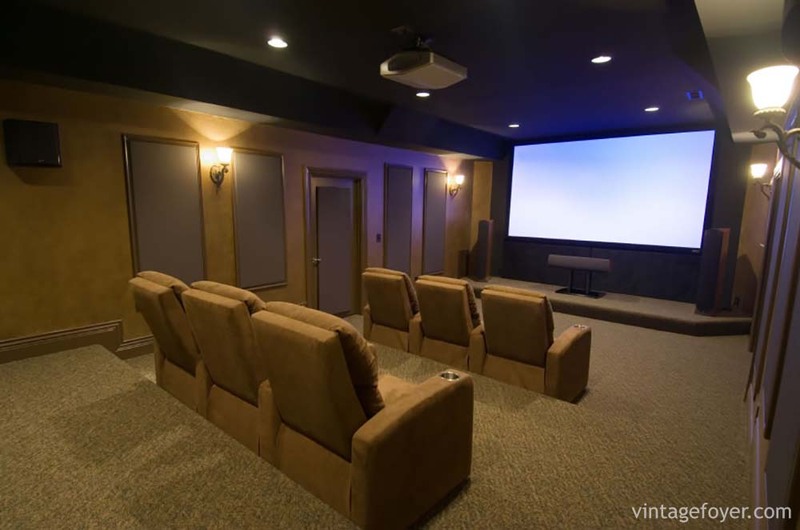 You can even update an old and unused bedroom or living space into a theater by adding plenty of seating and a large screen. 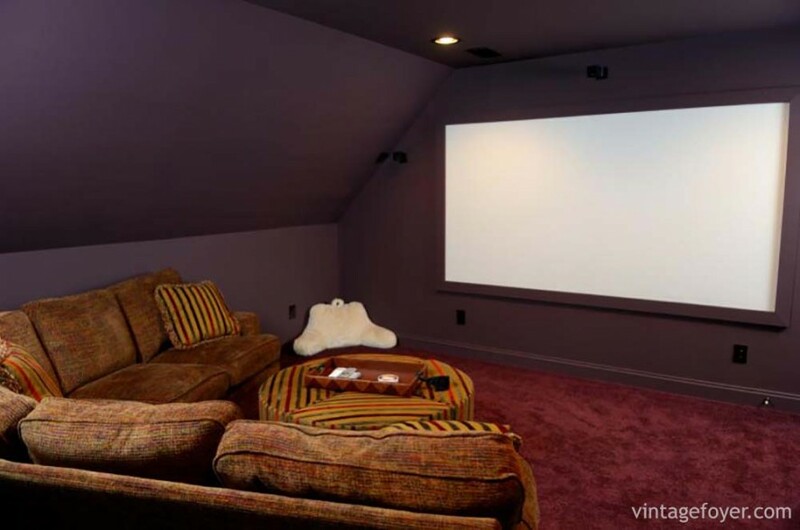 This basement theater is a perfect example of creating your own theater hideaway that feels distant and separated from the rest of the home. If you’re into technology and gadgets, a complex and modern cinema set up could be right up your street. If you’re investing in the best toys available, you might want to show them off to friends and family. If you do, this is proof that sound and visual items don’t need to be hidden away for your room to look fantastic. If you’re living as a couple or you want a private space where you can escape the rest of the family for a few hours at a time, limit the amount of seats in the room so you can have your own sanctuary to share as a couple when you need it. 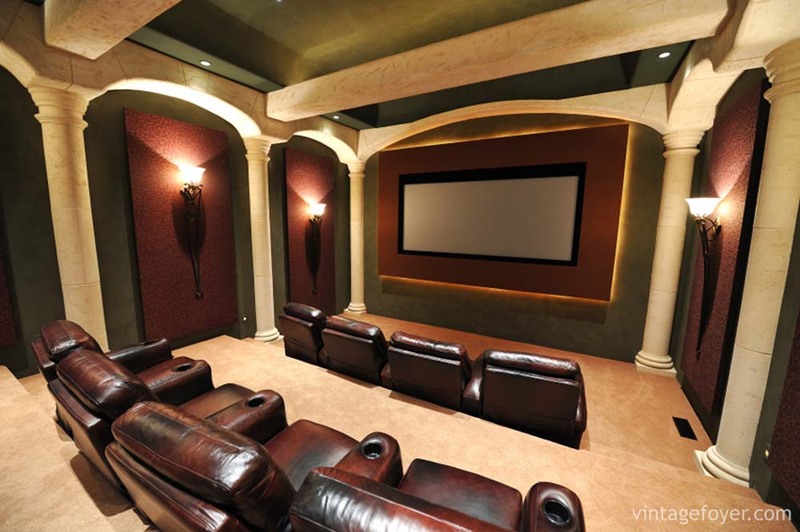 This super elegant and modern home cinema is worth the investment. The grey color theme makes the room cool, and the plush, low seating gives the room an informal feel that contradicts the sharp lines and modern styling. 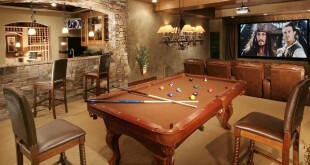 This is perfect for the bachelor pad! If you love warm colors, comfort, and today’s trends, get yourself some inspiration from this gorgeous relaxing home theater which uses brown coffee tones through the room, with modern and traditional lighting and funky geometric patterns. The final effect is a modern and beautiful home with a gorgeous, calm, and collected color palette. 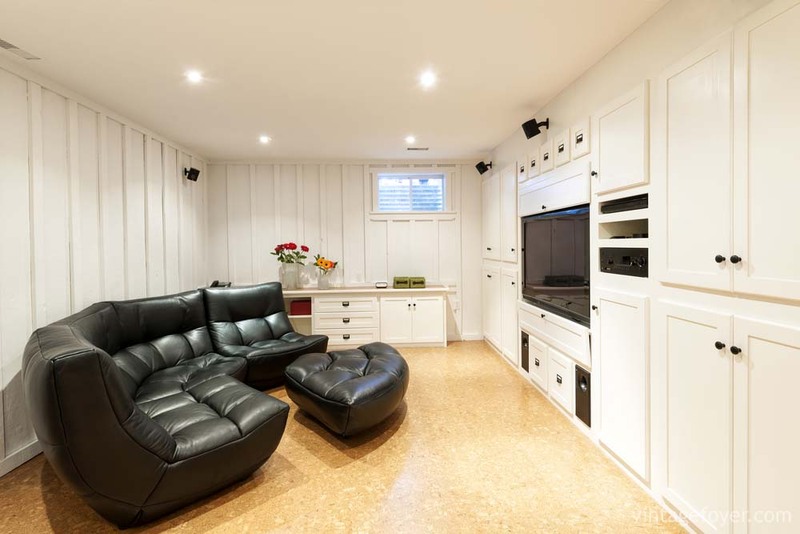 This is another wonderful example of how a simple living room can be updated to a room that doubles as a family space for communication and a home theater. The seating and décor keeps it informal and the family has the ultimate say on the future redesign of the room. This funky and futuristic home theater has a feel of the 1980’s with its red, white and black color palette, geometric shapes and mismatched textures. 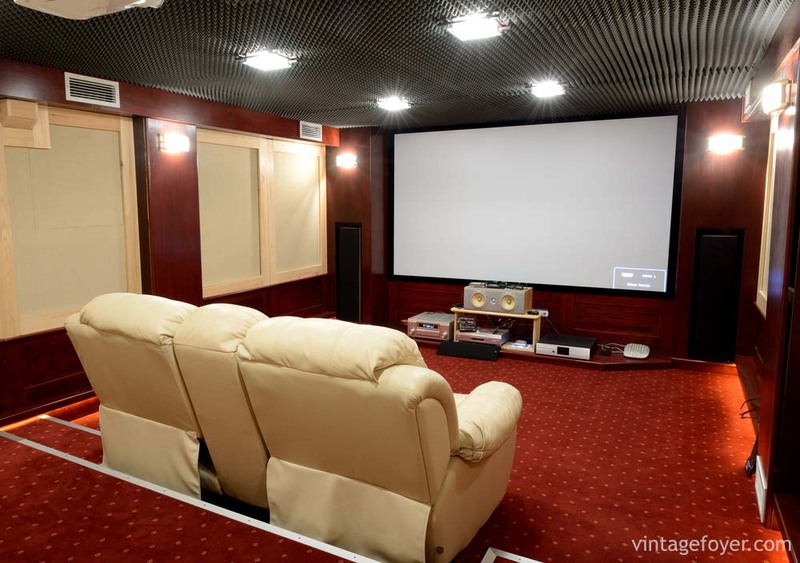 If you enjoy a cult classic, this could be the home cinema for you! 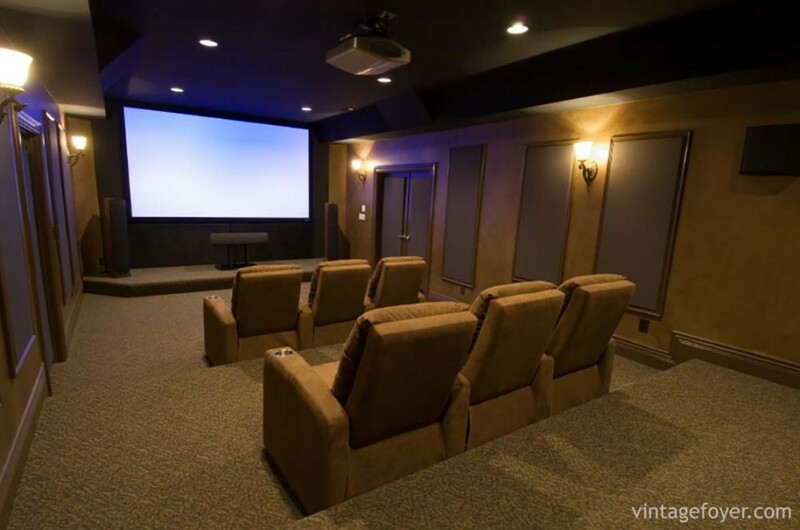 The blackout window shutters in this home cinema are an important decision in creating the best home cinema atmosphere you can possible achieve. 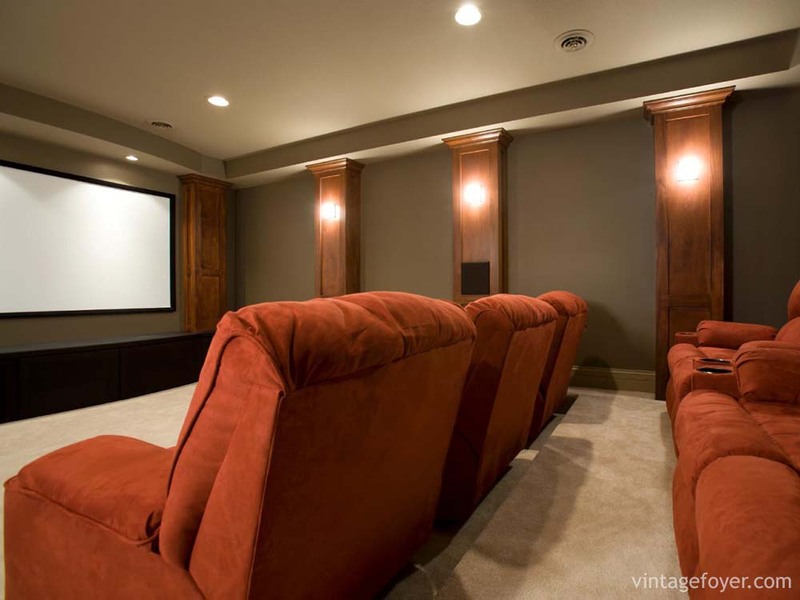 Being able to control the volume and brightness of the lighting across the room can intensify the drama of the movie, which is why no natural light has been allowed to enter this room while it’s in use as a home theater. 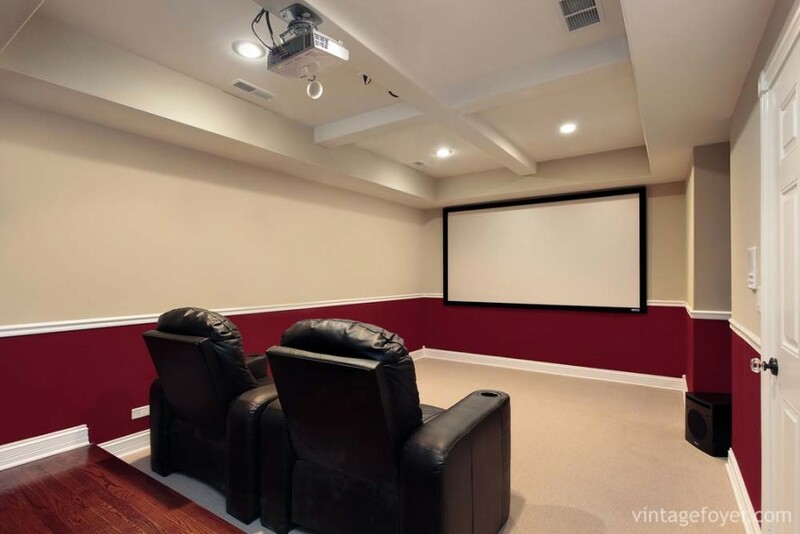 Give your home theater a bit of magic and include a simple automatic projector screen for fun and impact. 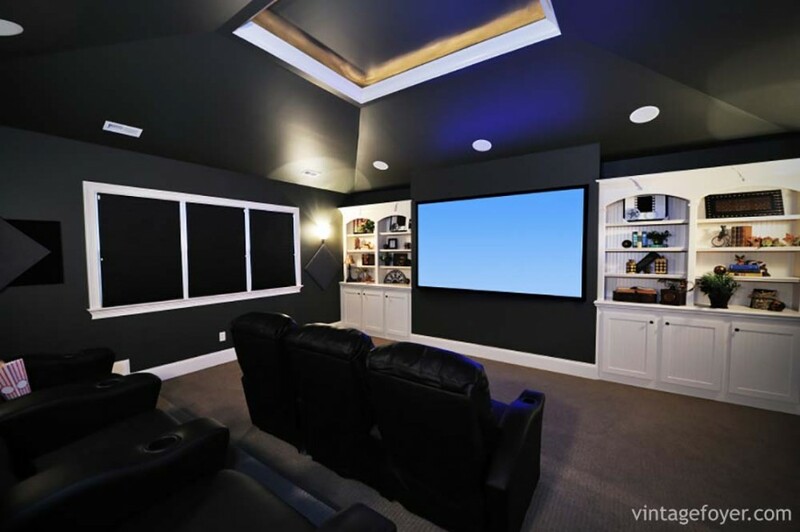 With the screen hidden away, you can also use the theater space for your own live performances if you or your family are into drama or games. Curved screens are booming in popularity now for the high definition and fantastic visual affects which you can gain from them. 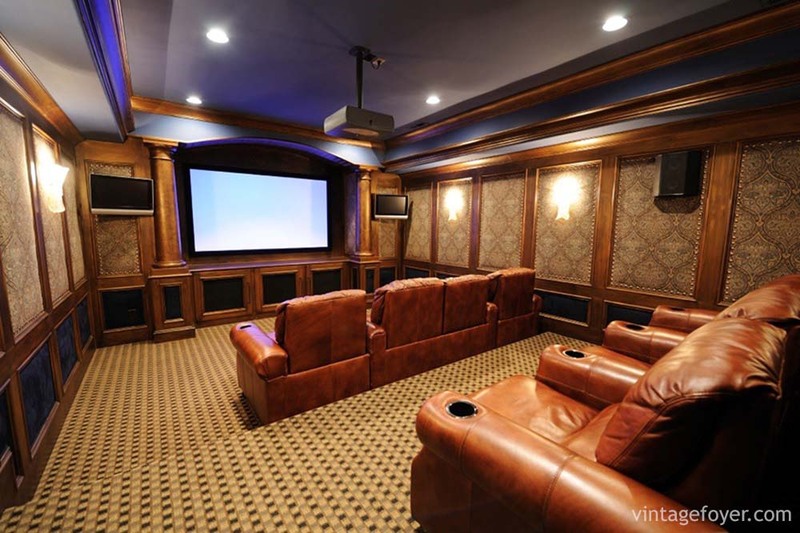 If you want the best screen and home theater that money can buy, take inspiration from this stunning and relaxing home cinema with curved screen and surrounding cabinets and make the investments to recreate your own version of this up to date and stylish room. 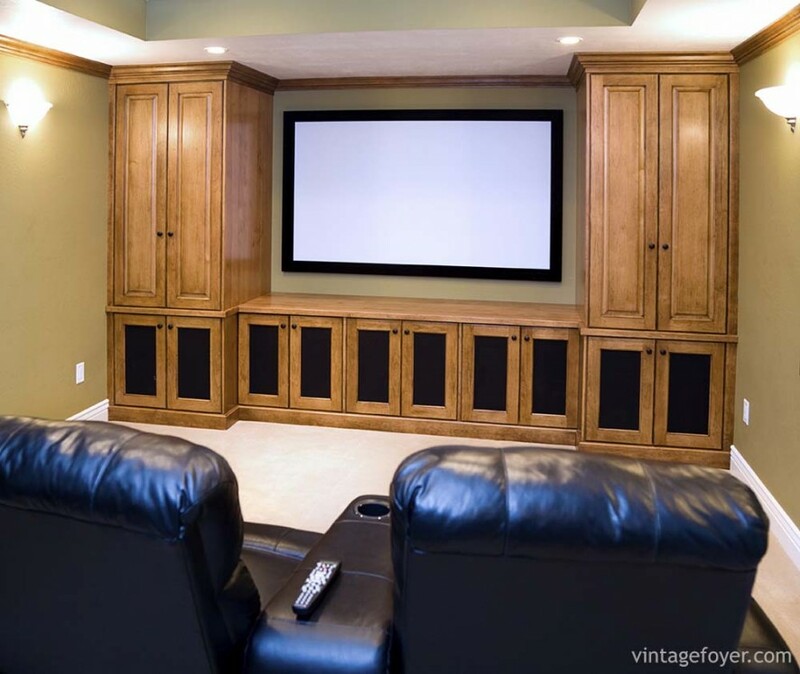 If you have a spare bedroom or old home office that isn’t being used to its potential, you can update your home by taking out the old and adding your own home theater. It’s as simple as adding a couple of chairs, spotlights, and a projector and screen. It’s a simple job and won’t cost you an awful lot of time or money. This serious cinema layout and seating gives users the experience of a real cinema without needing to leave the house. 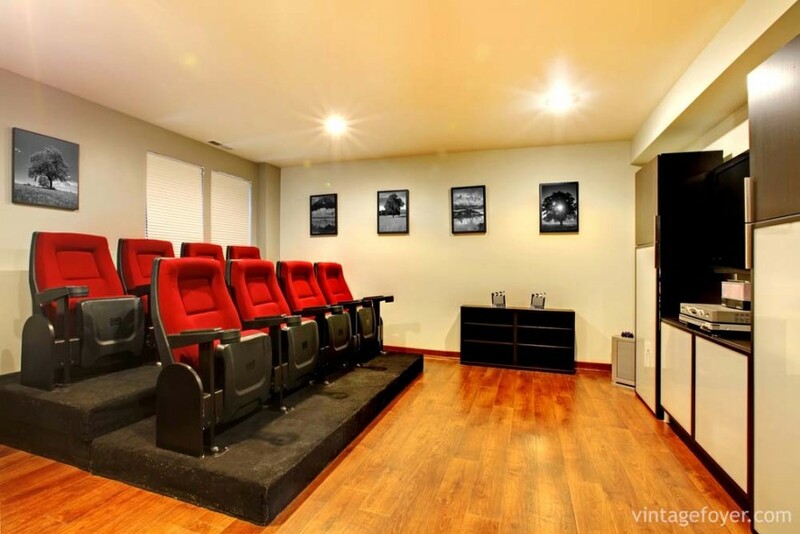 It is perfect for film buffs and people who want to impress friends and families! No color palette says intensity and drama like black and gold. The strong color palette adds luxury and elegance to the theater, gives a head to the popular Art Deco trend, and maximizes the impact of the movies on the screen.